FOXY ... now known as Maxy, a 1.5 Year old, Male sweatheart found his new home July 27th, 2001! Foxy was welcomed into the Sisti Family. There he is learning the ropes through the teaching paws of his older husky sister Bocce. Thank you to Perry and Claudia for giving Foxy a chance to become a part of your lives. 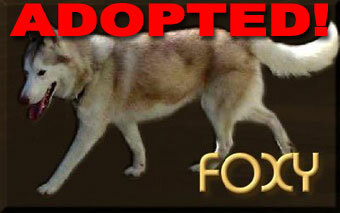 To the Furry Friends Network: Thank you for taking care of Foxy and helping him find his forever home! The 4 of us are alive and well in Harrisburg! Maxy is a great dog and is doing very well. Bocce still has some reservations about him but she is showing signs of improvement. She comes out from under the bed more and is eating more. Maxy is not "bothering' her as much. Hopefully, they will become friends. He is never far away. Unfortunately, I am in an air cast (carpel tunnel from training for a long bike ride) and can only walk the dogs a 1/2 mile 2 times a day. In this heat, though, they don't seem to mind. Perry pets and plays with Maxy a lot even though he says Maxy looks like Jimmy Durante with his long nose. Just wanted U 2 to know Perry and I are enjoying Maxy. (but Perry will never admit it) Maxy and Bocce play well together. He is a sweetheart. Bocce actually eats better since she has to eat or he will eat her food. Bocce is beside me now and Maxy is in the living room with Perry.